Have you gotten your bread and milk yet? You should because Connecticut is looking at its first major winter storm of the season. Winter Storm Harper is set to dump half a foot or more of snow on our state with some sleet and freezing to close it out. 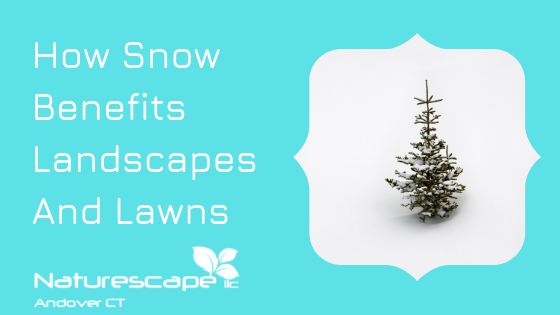 Though snow can cause some damage to lawn and landscapes, it can actually be beneficial as well. Today’s article is on how snow benefits landscapes and lawns. Snow can act as an insulator to some plants. This will also allow the plants and grass to conserve nutrients like nitrogen. It protects them from freezing and gives them moisture as it melts. Many perennials are happier when there is snow to provide for a cool blanket to protect against the cold winter winds and fluctuation in temperatures. Providing a good mulch layer in the fall helps prevent some of this fluctuation and loss of nutrients. Snow can also boost the power of winter fertilizer. The melted snow will bring the fertilizer down to the soil and roots. Winter fertilizers are usually low in nitrogen with higher levels of potassium for root growth which is conserved in the winter months for springs mad rush for growth. If your snow accumulates heavily on trees, bushes, and shrubs, you might want to gently remove some of it with a broom. Gently tap the branch to dislodge the heaviest parts of the snow. Snow piles that accumulate on the edges of lawns from plow trucks can cause browning on your lawn. These piles tend to freeze and harden damaging the grass underneath. One common lawn disease you’ll see in the spring is Snow Mold. White and pink concentrated circles three to twelve inches in diameter may show up on the lawn due to this fungus. The best remedy for this is raking the patches to allow air and sun to penetrate the area. That with your first lawn application of fertilizer will help to reduce damage caused by Snow Mold. Any seeding that has been done last fall or after will hesitate to germinate in the cold weather. That is good because a young grass seedling will succumb to colder weather. Snow provides protection against freezing and thawing keeping new grass from germinating too soon. Cool season grass such as Fescue, germinate best when the soil temperatures are between 50° and 65° degrees F. These soil temperatures usually occur when the daytime air temperatures are between 60° and 75° degrees. So if you’ve planted seed last fall that has not come up you may be in for a surprise when the temperatures finally warm up. The cold weather is helping to cool our soil which will keep weeds down more than you think. A warmer soil means more weeds and a longer season for mowing. Perhaps some lawn and landscape companies would like a longer season for business I like the off season and enjoy getting other projects done. The cold weather gives us more time for planning better landscapes and less time spent on maintenance. Snow not only benefits landscapes and lawns though, it helps us. It provides many benefits that people tend to dismiss. More than half of Americans say they don’t get enough sleep which is seriously damaging to your health and well-being. And for many of us, a snow day is the perfect day to catch up. Snow eases aches and pains, it gives us energy by requiring it of us (remember if you want to use it – use it! ), it requires us to change our routine and spend time with family or read a book you’ve been wanting to read. Instead of moaning about having to shovel or deal with driving in the snow think of the benefits we get from that cold refreshing nurturing from the sky! We hope you enjoyed our article on how snow benefits landscapes and lawns. Stay safe in the storm and we will talk to you soon!